The theremin was the world first electronic musical instrument, created by a Russian inventor named Lev Sergeyevich Termen in 1919. The theremin's natural tone is quite close to a sine wave, and it is said that the sound is warm, resonant and healingful. However because of its spooky tone, the instrument has been used as the premier sound effects for horror and science fiction movies. ThereminSS, unlike the actual theremin, doesn't require any techniques nor proficiency. You can simply play it just by touching the inner side of the white dotted line. 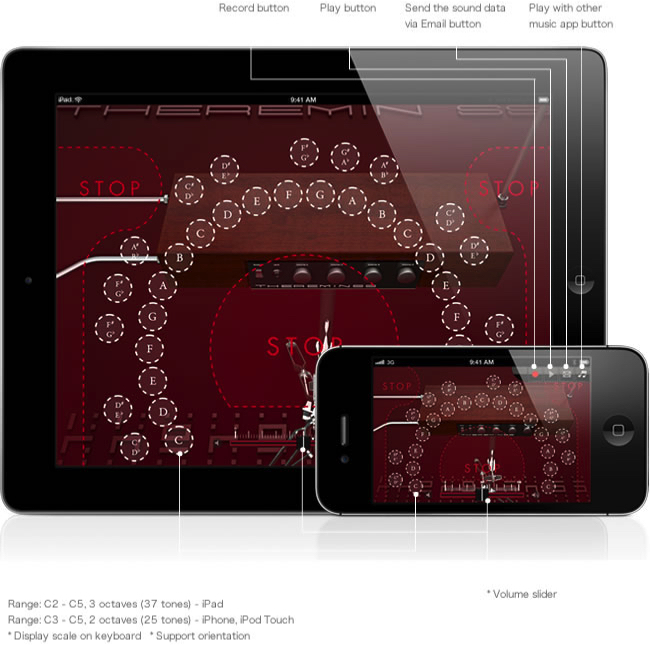 Enjoy the unique world of ThereminSS with a 3 octaves scale (the iPhone version features a 2 octaves scale)!